Verify the date and place of SFBAPCC meetings by checking the top of the postcard.org home page (or calendar). Club meetings are usually held on the 4th Saturday of every month except December from 11 AM to 3 PM in Building C (usually in C-260) at Fort Mason Center. 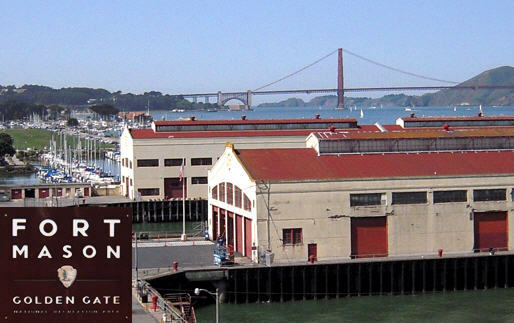 Fort Mason Center is located between Fisherman’s Wharf and the Golden Gate Bridge on San Francisco Bay. There is no Fort Mason street address (which is a legacy from its military past). From East Bay: Bay Bridge to Fremont St. Exit; on Fremont St. (100 yards north) go right on Howard St. (first right off of exit); left onto Embarcadero Blvd. and go about 2 miles; left onto Bay St. and go 2 miles; right on Buchanan St.; cross Marina Blvd. and take a sharp right into Fort Mason Center parking. We meet in Building C (usually in C-260). From North Bay: Take the Golden Gate Bridge (US 101); head toward San Francisco and exit at Marina Blvd. 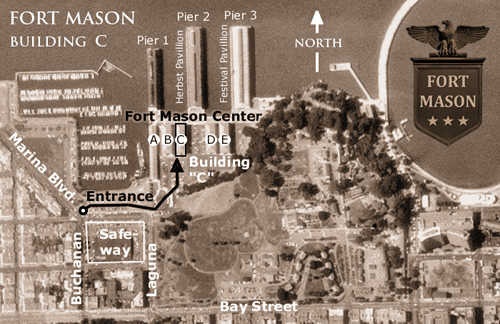 ; go 1.5 miles to Buchanan St.; turn left into Fort Mason Center and make an immediate right toward Fort Mason Center parking. We meet in Building C (usually in C-260). From Peninsula/South Bay: Take US 101 North to the 9th St. Exit; exit at 9th St.; take 9th St. across Market St.; left onto Hayes St.; right onto Franklin St.; left onto Bay St.; right onto Buchanan St.; cross Marina Blvd. and take a sharp right into Fort Mason Center parking. We meet in Building C (usually in C-260). or, use the intersection of Marina Blvd. & Buchanan St. in San Francisco, CA. Parking might be difficult. Pay close attention to parking restriction signs (especially near the small boat docks). Also, Safeway will tow cars that do not belong to Safeway shoppers. There is an hourly fee for parking within the gates of lower Fort Mason Center in the parking area adjacent to our meeting room. Enter the lower Fort Mason Center parking area at the intersection of Buchanan Street and Marina Boulevard. Make a sharp right into the Center. Parking fees. Upper Fort Mason (entrance at Franklin and Bay Streets) and parking spaces maintained by the National Parks Service (for example: along the Marina Green) are free. See SF MUNI, 511 Trip Planner or Nextmuni for more details. * To listen to the foghorn on the Golden Gate Bridge, an mp3 audio file player plugin is reguired. Please download free Apple Quicktime, free Winamp, or free RealPlayer if needed.